At first glance, the title of this post may seem a little trivial – I’d never seen a movie at a particular venue before? So what? But like with any good story, it’s the details that are important. This wasn’t just any film, and not just any venue. Citizen Kane is one of the greatest American movies in history (arguably THE greatest, according to Sight & Sound‘s poll of film professionals, naming the film as such for the past five decades). It was released in 1941 and to this day it stands the test of time as a cinematically engaging, well-written, wonderfully paced movie. Orson Welles was only 25 when he made Citizen Kane (his first film), and he incorporated movie-making techniques previously not seen before (but widely imitated and adopted since). Citizen Kane was largely modeled after the story of real-life newspaper tycoon William Randolph Hearst, and the Xanadu palace retreat pictured in the film was based on Hearst Castle, here in San Simeon, California. At the time of the film’s release, Hearst took extreme offense to the entire idea of Citizen Kane and felt it was an attack on his character and choices in life. He never allowed the picture to be advertised in any of his newspapers, and he never watched the movie himself. 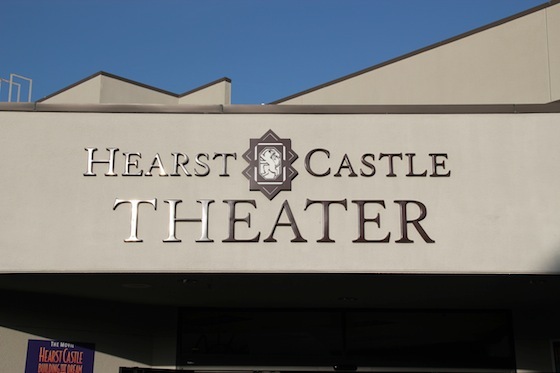 For the San Louis Obispo Film Festival this year, director Wendy Eidson almost jokingly put the idea out to Hearst’s great-grandson, Steve Hurst, of screening Citizen Kane in the one and only Hearst Castle. Much to her surprise and delight, the immediate answer was not “no”, and eventually the almost unbelievable dream materialized. We were lucky enough to experience this magnificent movie on a fantastic screen tonight. I could go on about the film, but I’ll just say that if you haven’t seen it, you really should. While the techniques of movie making certainly have changed over the years, it is important to appreciate where they came from – and to see just how much of what we’ve come to appreciate as good filmmaking is rooted in the elements shown in Citizen Kane. Orson Welles had a fascinating subject, a grand scale, but most importantly he told a beautiful, poignant and powerful story of a complicated man – and helped to bring us into his world – and see that our differences may not be as great as what makes us all the same. In late October 2010, David McRaney wrote a post about procrastination on his blog (You Are Not So Smart) where he used the Netflix queue as an example of impulsive behavior (lowbrow movies tend to go above more important flicks). Even as I was reading it, the film many consider the greatest movie ever made was currently in our living room, unscreened. I saw this film for the first time on November 15, 2010. It had been lying on the floor for weeks after Netflix shipped it to us. After we watched it (and loved it), I thought, “I really should not have waited so long to see this movie!” It got me to think about a lot of the other things I had not done, whether from procrastination or lack of opportunity. A little more than a month later, I came up with the idea for I’ve Never Done That. You might have noticed that I worked from the AFI 100 List during the year. Guess which film sits on top of that list. Even though it was never officially listed as an item on the blog (though it is mentioned on the splash page), I like to think of “Watched Citizen Kane” as the first “I’ve Never Done That”. If Orson Welles had not made this incredible work of cinematic art, you would not be reading these words today. Citizen Kane did not just influence many of the movies you see now, it’s also responsible for the 365 new things I did last year and the 366 Jenn is doing in 2012.